The period 1981–1991 witnessed a dramatic transformation in the relationship between the United States and the Soviet Union. During these years the specter of a nuclear war between the superpowers receded as the Cold War ended swiftly, nearly entirely peacefully, and on U.S. terms. When Ronald Reagan became president in January 1981, such outcomes were inconceivable. The Soviets had invaded Afghanistan, causing President Jimmy Carter to withdraw a strategic arms limitation treaty (SALT II) from Senate ratification, boycott the 1980 Olympics Games in Moscow, and ban U.S. grain sales to Moscow. Détente—or, “relaxation of tensions”—yielded to confrontation. Committed to restoring U.S. strength and reversing strategic imbalances real and perceived, President Reagan pursued a comprehensive modernization of U.S. nuclear and conventional forces and attempted to roll back communism in South America, Africa, and South Asia. At the same time, he wrote to Soviet leaders Leonid Brezhnev, Yuri Andropov, and Konstantin Chernenko, imploring them to alleviate Cold War tensions and negotiate arms reductions. He lifted the grain embargo as a show of good faith, but the crackdown on Solidarity and declaration of martial law in Poland in December 1981 led the President to declare further economic sanctions against Moscow and curtail U.S.-Soviet academic exchanges. Although formal nuclear arms control talks resumed, the relationship between Washington and Moscow remained tense throughout Reagan’s first term. The President spoke of leaving “Marxism-Leninism on the ash-heap of history;” labeled the Soviet Union an “evil empire;” and introduced the Strategic Defense Initiative (“Star Wars”), which Soviet leaders found highly threatening. The nadir of this time period was the fall of 1983, when the Soviets shot down Korean Airlines Flight 007 over the Sea of Japan, NATO deployed a new generation of intermediate-range nuclear missiles in Western Europe, and Soviet negotiators walked out of arms control talks in Geneva. Reagan’s top advisers disagreed about Soviet strategies. Secretary of Defense Caspar Weinberger was deeply skeptical of arms control. Secretary of State George Shultz believed that agreements would enhance U.S. security. The President seldom intervened to resolve such disputes, yet he shared Shultz’s enthusiasm for establishing a dialogue on human rights—in particular, the plight of religious and political dissidents—as a central focus of U.S.-Soviet negotiations. In January 1984, he delivered an eloquent speech, drafted by his Soviet aide Jack Matlock, which imagined the human connections that fictional American and Soviet couples could forge if left to their own devices. Fearful that Reagan had moved too quickly to accept Gorbachev’s good intentions and the feasibility of his economic and political agenda (“Perestroika” and “Glasnost”), President George H.W. Bush ordered a strategic review to reassess U.S. objectives toward the Soviet Union in the first months of 1989. Simultaneously, Assistant to the President for National Security Affairs Brent Scowcroft reiterated that the Cold War was not over, and Secretary of Defense Richard Cheney publicly stated that Gorbachev’s reforms were destined to fail. These statements aggravated Gorbachev, yet the pause did not derail the constructive relationship between Washington and Moscow. Gorbachev accommodated as revolutions occurred in Central and Eastern Europe that fall. 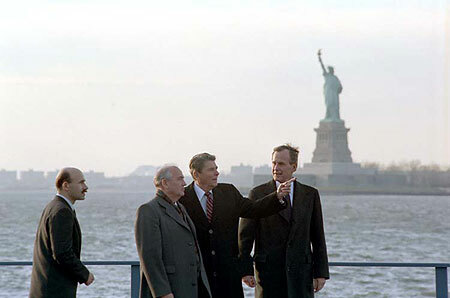 After Bush met with his Soviet counterpart off the coast of Malta in December 1989, one month after the fall of the Berlin Wall, Gorbachev’s spokesman declared, “We buried the Cold War at the bottom of the Mediterranean Sea.” In the months that followed, Bush worked with the Soviet leader to allow for the peaceful reunification of Germany within NATO, to sign the Conventional Forces in Europe (CFE) treaty and the Strategic Arms Reduction Treaty (START), and to enable the transition to democratically-elected governments in countries emerging from Communist rule. As Gorbachev’s economic reforms foundered and his political base crumbled in 1991, the Bush administration increasingly engaged Russian President Boris Yeltsin. Yeltsin turned back a coup against Gorbachev in August 1991, but in subsequent months consolidated authority over political and military institutions, and increasingly supported Russian independence and dissolution of the Soviet Union. On the evening of December 25, after speaking to Gorbachev on the telephone, Bush addressed the nation from the Oval Office to announce that the Soviet Union had ceased to exist.